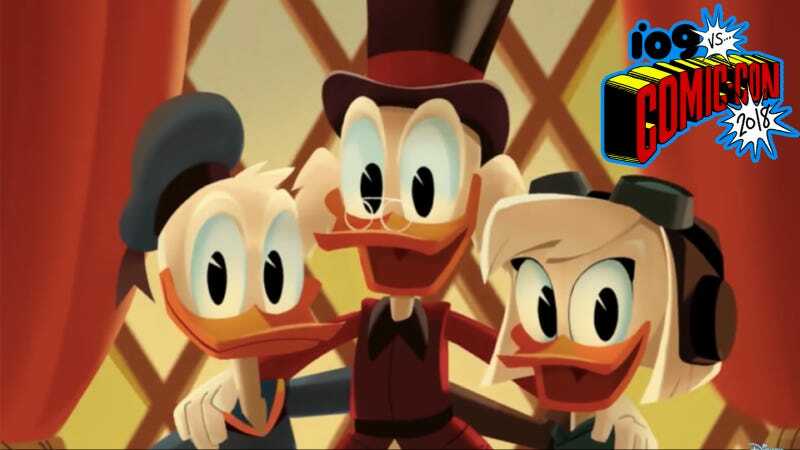 Donald, Scrooge, and... Huey, Dewey and Louie’s long-lost mom?! Indeed it is. A thing I have said at least three times today to the io9 staff, apropos of nothing: The new DuckTales cartoon is really, really good. Now I have proof, thanks to this preview of the rest of the show’s first season which debuted earlier today at—where else?—Comic-Con. The fact that the show even thought to bring this never-before-asked question up is just part of what makes the show so good. There’s also the facts that, as the trailer shows, it is bringing back the Three Caballeros, the stars of the nearly forgotten 1944 Disney half live-action, half-animated musical, made up of Donald, the parrot Jose Carioca, and the rooster/gunfighter Panchito Pistoles. And then there’s the voice cast: I’ll never get over David Tennant voicing Scrooge McDuck, or Lin-Manuel Miranda as Gizmoduck, but that’s Tennant’s Doctor Who co-star Catherine Tate as the voice of Magica. Oh, and did I mention Don Cheadle will be voicing Donald Duck at some point later this season? Sounds like one duck will be getting some vocal lessons. It’s all been adding up to a hell of a lot of fun, and this footage has only me more excited for the rest of the season. Again, here’s the main news if you haven’t been watching it already: The new DuckTales is very good. That is all.